Tea Party Caucus is dead, but other Tea Party groups will form anew. 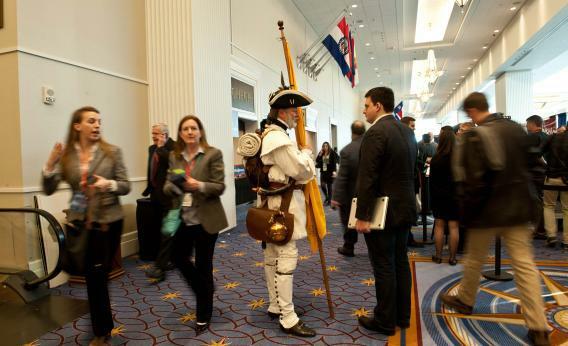 Your intrepid blogger speaks to a Tea Party activist dressed in Revolution-era garb at the Conservative Political Action Conference (CPAC) in National Harbor, Maryland, on March 15, 2013. Two-odd months ago, I asked a Republican Hill staffer what had happened to the Tea Party Caucus. Launched with great fanfare in 2011, it was often cited in Michele Bachmann’s introductions on the presidential campaign trail—“she’s the founder of the Tea Party Caucus!”—and it brought luminaries like Antonin Scalia in to educate Republicans. At its height, the caucus had 60 members, but 10 of them lost their 2012 elections. So how many members remained in the caucus? “We are actually in the process of re-filing the caucus,” said the staffer. There’s no way to un-spin this. Nationally, the Tea Party flag is so tattered that it’s not in a Republican’s interest to maintain it. (This isn’t true in some states; the Texas Tea Party caucus is alive and well in Austin.) At the same time, the fade of the “Tea Party Caucus” itself is a positive development for Republicans. Ideological conservatives always had their qualms about the group. It allowed members who didn’t have movement bona fides—Denny Rehberg, Todd Akin, Dan Burton—to “Tea-wash”* themselves. When Bachmann’s presidential campaign fell apart, for a lot of reasons specific to her, it damaged the movement. The Tea Party, when it works, is closer to a starfish than a spider. A spider dies when a leg is cut off, but a starfish grows a new leg. The caucus was not missed; we’ll see how much attention is engendered by Version 2.0. *Not sure if anyone uses that term but me.